It’s an idea I’ve had in the back of my head for some time now, rattling around like ball bearings escaped from a loose bottom bracket. I wanted a bike. Not just any bike — I’ve already got (ahem) a few of those — but a bike as near-custom as I could afford, and representing a specific aesthetic that I've always felt an attraction for, but have never indulged in. First, though, a confession. I'm a cyclist. Well, I'm more than a cyclist. I'm a bicycle commuter, who lives what is called a "car-lite lifestyle." I rarely drive. I'm also a certified Cycling Safety Instructor by the League of American Bicyclists. I am, with bikes, the way other men are with cars -- satisfied to while away my hours discussing the merits of SRAM vs. Shimano derailleurs, or in the shop, fine-tuning the brake action on one of my bikes. Cycling intrinsically satisfies multiple desires simultaneously. The mechanics of cycling are an absolute delight, cogs turning, chains shifting and wheels spinning all with as much grace as we can put into them. The delight of making bicycles go satisfies the part of my brain that was inherited from my engineer father, who never saw a device he didn't think that he couldn't improve. I was his gofer for most of my youth, and absorbed from him the joy of building and tinkering. Cycling engages me morally, as well. In a world where so much is wasted, from materials to food to energy sources, the bicycle stands apart as the most efficient of mankind's inventions. My ethics and morality are firmly based on, first of all, a profound respect for nature. Wasting Mother Earth's bounty so that we can drive 3 miles to the supermarket without having to disturb our equanimity by being a bit chilly, or getting a few raindrops on our heads, is simply indefensible. Particularly when we live in an age where we are guzzling our few remaining natural resources like a 12-year-old downing a Big Gulp after a soccer match, I find such behavior a bit offensive. Ride a bike to the store! You won't melt, you won't freeze, and don't even try to tell me that the extra travel time it takes wouldn't be otherwise wasted scrolling through your Facebook feed. You also won't get hit by a car. You're safer on your bike than you are in your bathroom, and that's a fact. Finally, cycling is a key part of my health. Humans are designed to be physically very active; the vast majority of chronic diseases I treat in my practice stem largely from a lifestyle far too sedentary. I know that I notice a big difference in my well-being when I'm off the bike for an extended period. I get fatigued, I get sick, I begin to feel toxic and fat and sad. And it's absolutely nothing that a few weeks of daily riding can't fix, no drugs needed. With that as background, it is perhaps more understandable that an unfulfilled concept of a bike might latch hold onto a few brain cells and not want to let go for years on end. Since the mid-1980s, I've primarily ridden recumbent bikes, those low-slung two-wheelers that encourage people to shout, "laying down on the job again, eh?" as I pass by, a comment that always makes me smile. More recently, I've taken to riding a recumbent tricycle, which is best described as a human-powered go-kart. The trike is a perfect commute/errand vehicle, as it requires little thought to ride, and since I don't have to balance, I can grind my way up the Litchfield hills as slowly as I want; a nice option to have when I've been on my feet for 10 hours straight treating patients, and the only thing that stands between me and home is an 8% grade. (The downside of that hill, at 45 mph, is exhilarating). 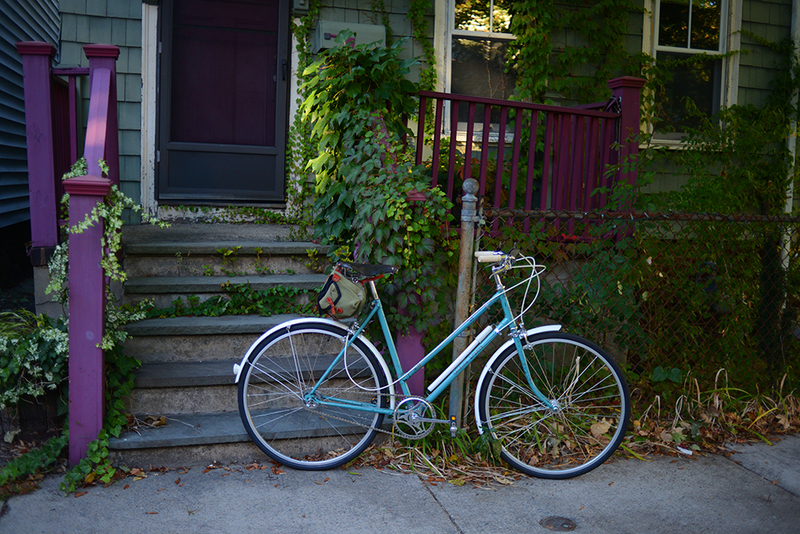 As delightful as these bikes are, they lack a certain mystique. So divorced are they from "traditional" bicycles that, in many minds, they aren't bicycles at all, but a curious wheely thing that some nutcase is riding down the road in front of them. And while I take pleasure in the swoopy cruciform of my trike's frame, or the resemblance my recumbent has to an ape-handlebar Harley (I call that bike my "Alternative Technology Hawg"), there is, after all, something meaningful in a traditional upright bicycle. Call it my "wine and baguette" fetish if you will, but there is something deeply appealing to me, aesthetically and spiritually, of that French country bike, or English three-speed, with its leather saddle and wing-like handlebars, a loaf of bread and bottle of Merlot poking out of canvas panniers. It speaks to me of a different era, where food was less plentiful but more nutritious, exercise was not a task relegated to gym or treadmill but incorporated into daily life, and time was more leisurely, our pastimes spent in congenial personal discussion and discovery of our immediate environment rather than rancorous online debate and NatGeo pictures of places we will never experience personally. In recent years, Grant Petersen of Rivendell Bicycle Works has exemplified that aesthetic in his design and his marketing. Rivendell bikes are highly desired by that part of the cycling population who are less interested in road races and time trials than in the spirit and beauty of bicycles during the post-World War golden age of cycling. As lovely as Grant's bikes are, they suffer from a uniform deficiency, at least in my regard. Grant is a tall man, and he designs bikes for people shaped like him. Of which I'm not. I'm short and barrel-chested. With a huge air intake and a preternaturally efficient heart, I'm perfectly designed for hauling heavy loads over long distances. I will never, however, exhibit the long, lean grace of cycling greats, and a bike designed for them will never be comfortable for me. I've searched, over time, for a way to create that aesthetic for myself. My best attempt was a rebuild of a 1970s Fuji frame, replacing the drop handlebars with a Petersonian moustache handlebar, leather saddle and faux leather handlebar wrap. Once rebuilt, the transmission was smooth and shifting precise; but the low-end 1970s steel tubing proved to be less than responsive, and, unlike the Rivendell bikes, the frame geometry was unsuited for the upright, more stately ride that I had in mind. Eventually, the forks fatigued and began to fail, relegating the Redbike, as I had dubbed it, to the winter trainer. Now, however, the stars have aligned, and I'm about to begin the build of my life. While cruising aimlessly about the internet, I stumbled over a frame manufacturer on the West Coast that makes beautiful, yet sturdy, bicycles. 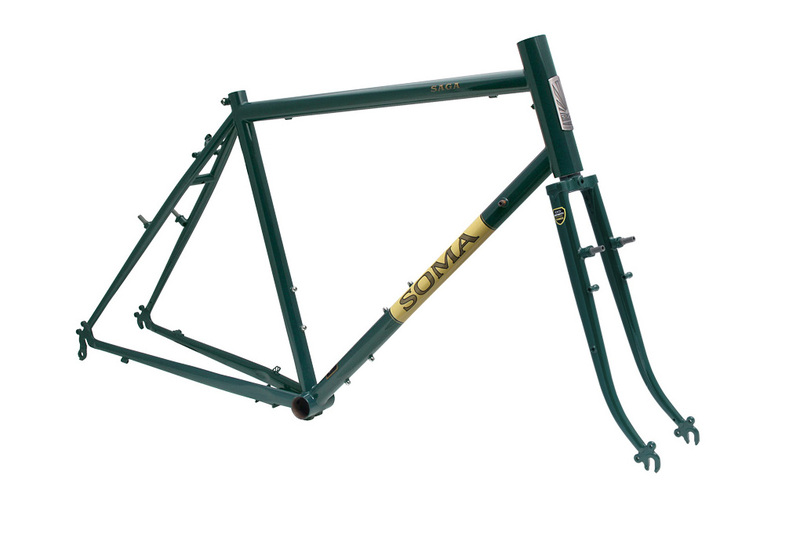 Among Soma's offerings is the Saga, a so-called "touring" frame whose geometry is almost precisely designed for me and how I want to ride the bike. It sports British Racing Green paint, cream and gold decals, and a headbadge that calls to mind a Nick Carraway summer sojourn. Onto that frame, I am installing a hand-curated selection of parts, and I will be building this frame from the ground up. From bearings to brakes, each aspect of this bike will be built to conform to the vision that has sat restlessly in my head for these many years. At the end, I hope to have a bike that beckons to me to swing a leg over it and ride across the rolling hills of my home, to the far horizons where casual civility reigns. The first shipment of parts arrives Friday. Let the build begin! Older PostWhy you can't lose weight.